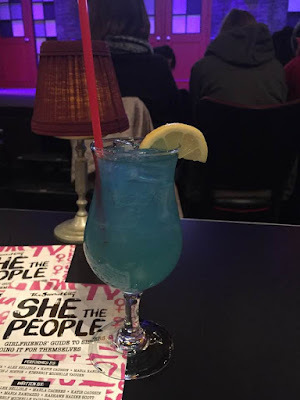 sweat like becky: Chicago Eats: Girl And The Goat and so much more!! Chicago Eats: Girl And The Goat and so much more!! 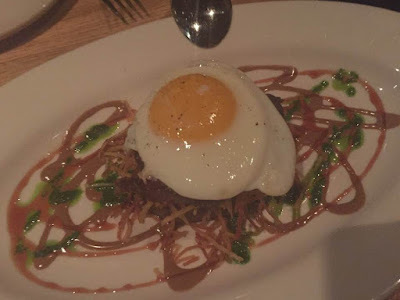 So here is my first post about our trip to Chicago and it is allllllll about the food we ate. I am going in order of the days we were there but starting with what was the highlight meal of my trip - if not my entire life. After that, everything is randomly ordered. One crazy thing about Chicago is that every restaurant whether in downtown Chicago or suburbia is freaking huge. Every place we went into was like significantly bigger then any restaurant I have ever been in here in Calgary. When Greg mentioned that he might be going to Chicago and I said very quickly that I was going with him, I went to Open Table to make a reservation for us to eat at Girl and The Goat. I knew it was popular, but I had no idea that you had to book at a minimum a month in advance to get a decent supper reservation. I did manage to get one for the Sunday evening at 8pm though and I was super excited. Fast forward a week or so later when Greg came home from work and told me that we had tickets to the Chicago Blackhawks game for that same Sunday night with the company that Greg was coming to do some testing or something for. Colour me disappointed. 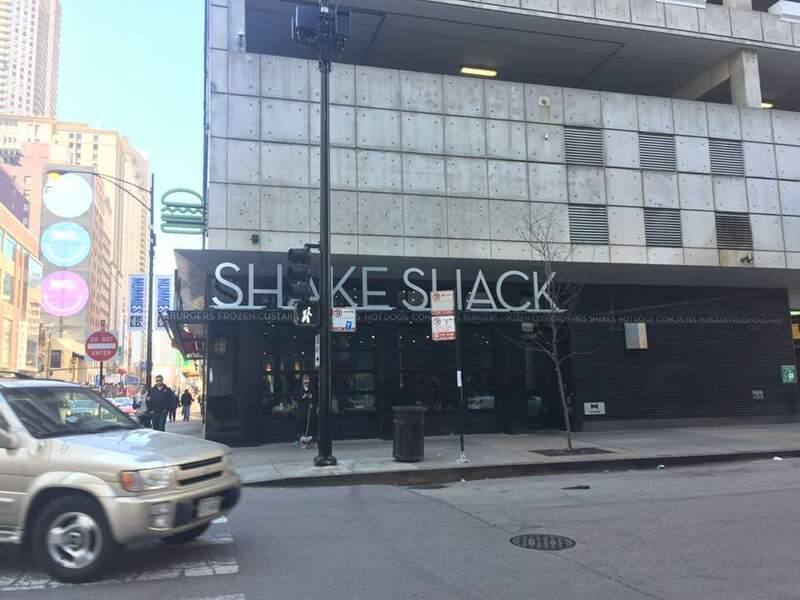 However, Greg kept checking for cancellations and on Saturday night at like 11pm, he found 2 spots had opened up at 10 + 1030pm for the following night. I was half asleep so I agreed to it but the next night at the hockey game, I was so tired that I wasn't sure if I was up to going but I got a second wind and we decided to go. It worked out because the restaurant is on the way home from the United Center to our hotel. It was mind boggling to walk into a restaurant at 10pm - on a Sunday night no less - and see how packed it was. The kitchen does close at 11pm Sunday - Thursday but as long as you have your food ordered before then, you will get all the food. They will do dessert after that but not any of the other items. They will stay open until the last table leaves. Our table wasn't quite ready yet when we arrived so we had a drink at their bar which was also packed. 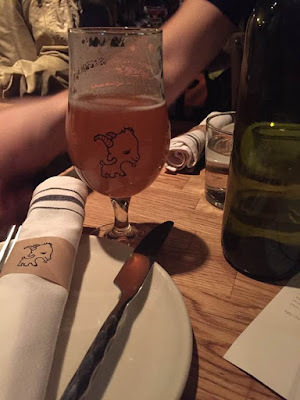 Greg had a beer of some kind that came in the cutest goat glass. I loved all the touches of their goat logo on everything. Even the back of the menu had it. I loved it. I got a cocktail called thyme is honey which was old forester bourbon, cynar, apple, pear, honey, lemon and thyme. It was really good but it did not have the cute goat on it. 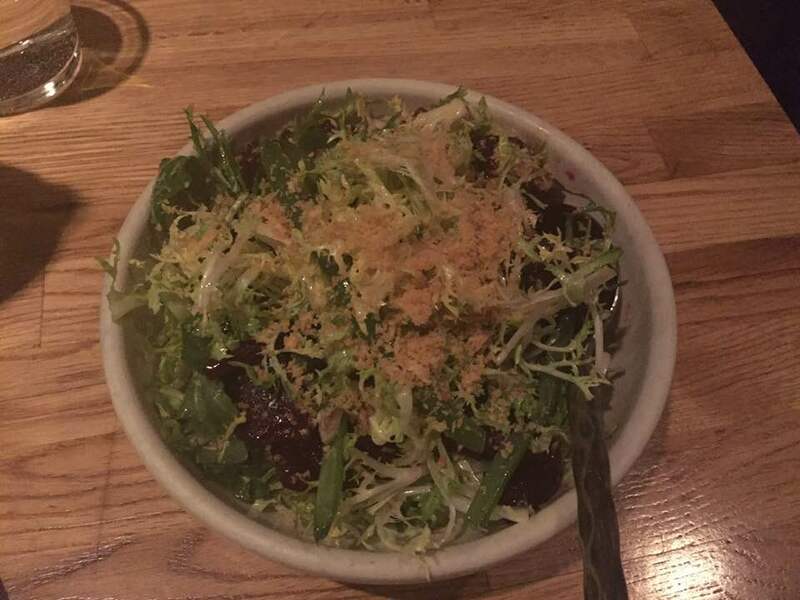 We started with the roasted beets salad which was green beans, white anchovy, avocado creme fraiche, and bread crumbs. It was so delcious - the bread crumbs were such a nice touch. 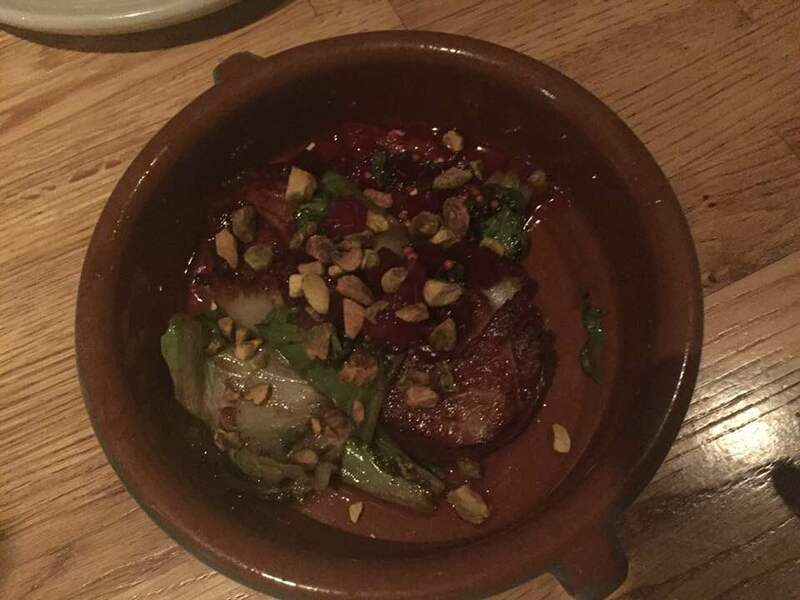 I really loved it but i love almost anything with beets in it. I was surprised I liked the avocado creme fraiche because I don't like avocado but it was really good. Next, we had the seared diver scallops which was toasted miso-brown butter aioli, blood orange, smoked beet and pistachio. It was literally the most amazing scallop I have ever had in my entire life. I don't know if anything will ever top this. The third and final plate we ordered was the wood roasted pig face. Yes pig face. I did ask the server before we ordered it that it didn't come out looking like a pig because I would probably be a vegan if that ever happened and then I would die since I don't like the right vegetables or protein to survive. She assured me it was a patty so we went ahead and ordered it. It was a sunny side egg, tamarind, cilantro, red wine maple and potato stix. Because a pig face is pretty fatty, the patty was a bit more tender or soft then I would have liked but it was still really flavorful. 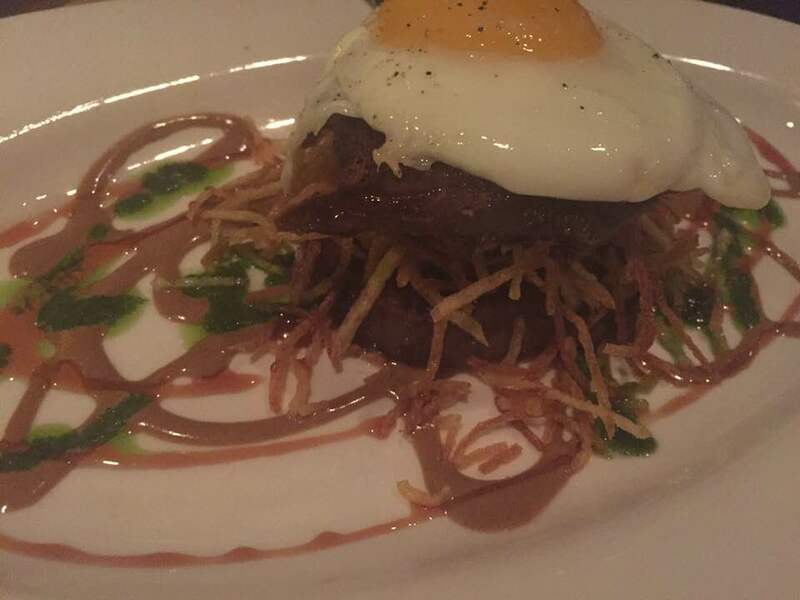 Here is another photo of the pig face patty. Seriously wayyy better then I anticipated. I had tried to convince Greg that we should order the confit goat belly which was served with bourbon butter, lobster and crab and fennel. Greg doesn't like goat and didn't think i would eat it and he is probably right, I just wanted to say I ordered it haha. The crazy thing about the girl and the goat's popularity is that it opened like 7 years ago and it is still almost impossible to get into. Stephanie Izard is the executive chef and owner of the restaurant and was the first female winner of Top Chef on the Food Network. She is amazingly brilliant and talented and it was such an honor to eat at one of her restaurants. She also owns Little Goat across the street which is a more diner feel but it still super busy. The first night we were in Chicago, we tried to go to the downtown location of Malnati's. 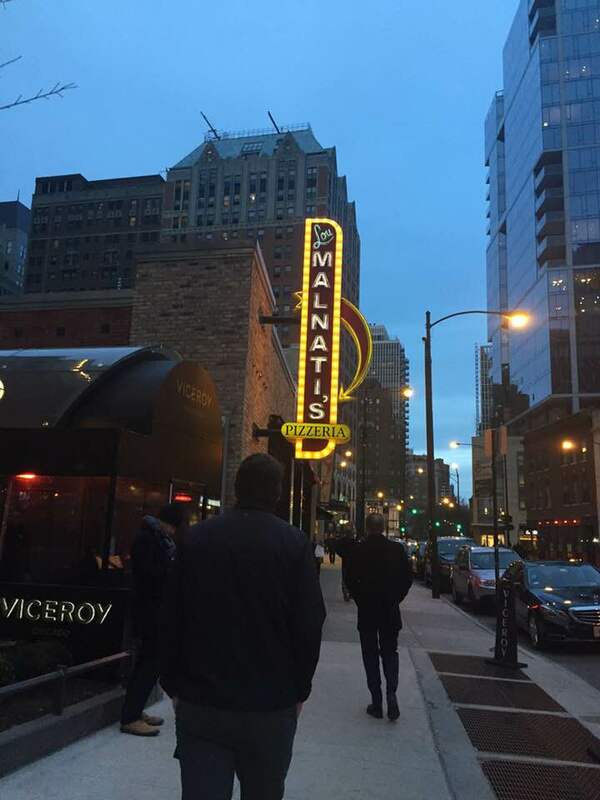 Apparentlly Lou Malnati's has the best chicago deep dish in the world. We got there at like 630 and the wait was like 2 hours and so we left but we did end up going to a different location on Sunday before the Blackhawks game. We were there at like 4 or 430 so we didn't have to wait but when we left around 6, it was crazy busy with a line up. Greg and the 2 guys that came with him from his company loved their pizza but me and one of the wives who came did not. She had a gluten free pizza and she said her crust was amazing but the rest of it not so much. I ordered a personal pepperoni with no cheese which i know is weird but it is how i roll. There is way toooo much sauce and it is really tomatoey which I don't like at all. It was boring. I didn't eat much which worked out since we went to the girl and the goat later that night. Apparently authentic Chicagians don't like chicago deep dish pizza and i totally get it. The one positive thing about Lou Malnati's was this beautiful twisted lemonade or something like that. 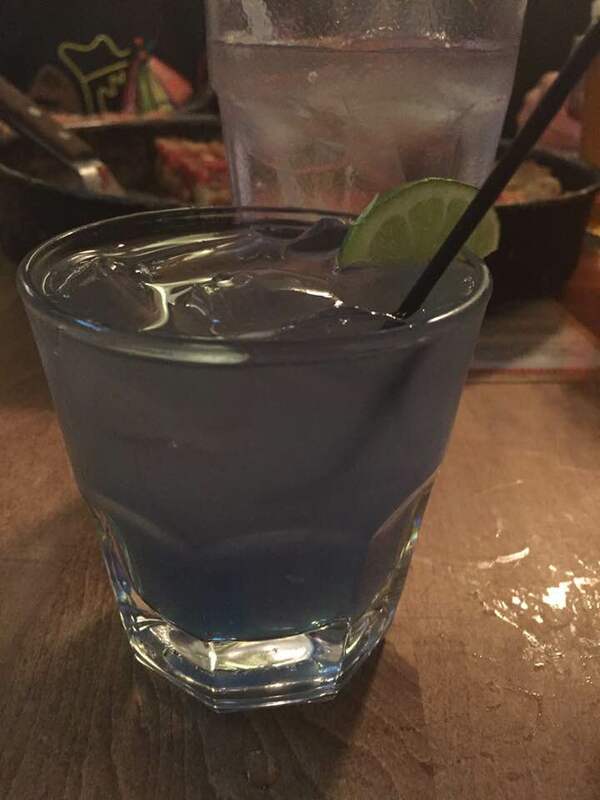 It was like blueberry lemonade with vodka in it and so good. I had 2 of them and it made up for the gross pizza. 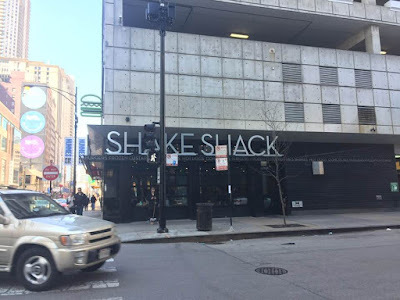 We spend a lot of time on the west coast and we are avid in n out burger lovers but we really wanted to try Shake Shack which apparently is the east coast version of in n out. We found one downtown so we headed there for lunch on Sunday. It was fairly busy but as per most chicago restuarants it was fairly big for a fast food joint. I just got a basic burger with mustard, a chocolate milkshake and french fries. I didn't love the fries and my shake was too thick that I had to wait forever to drink it but it was really tasty. The bun on my burger was a hot mess but the burger itself was pretty good. I don't know what greg had but he liked it but agreed that his milkshake was too thick. Overall we enjoyed it but we still prefer in n out to shake shack and in n out is like half the price too. 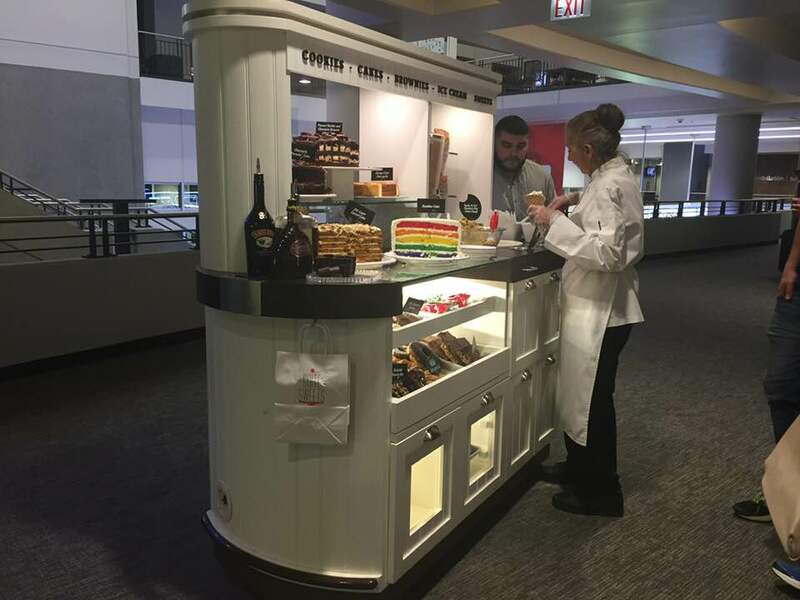 In the second period of hockey games at the United Center, they have a dessert cart that comes around to all the suites and offer you something from there. It is amazing! Greg got an ice cream with caramel sauce and a side of actual cookie dough which was so good. I had a hard time choosing but I finally settled on the rainbow layer cake because I knew the kids would appreciate my choice and it was ridiculously sweet and delicious. Such a cool feature for the United Center to offer to their suite guests. On Saturday night, we went to this place called Beatrix before we went to Second City. Again, it was this huge restaurant but I loved that it felt very cozy and I loved how all the tables and chairs were different. It was definitely a cool place to eat. We had these kung pao brussel sprouts that were amazing. They were like the kung pao shrimp at the earls but wayyy spicier and so good. 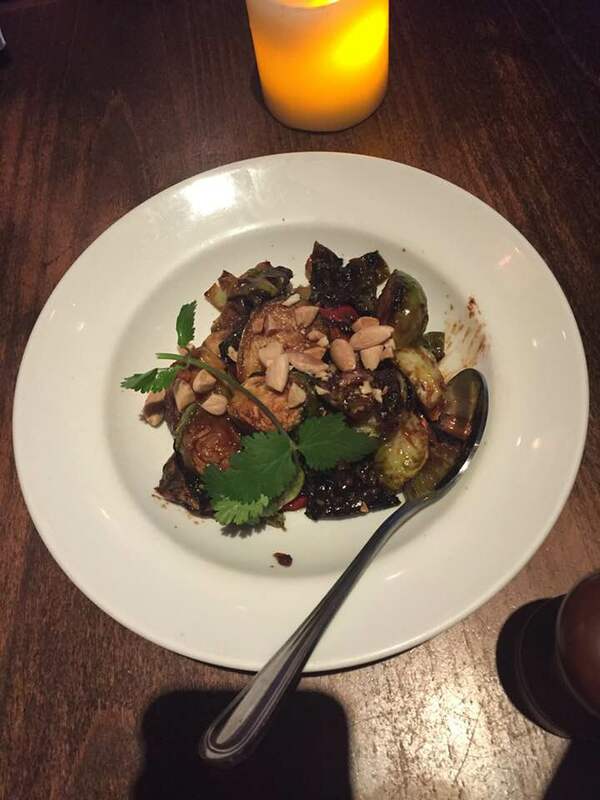 Greg and I have this rule where if there are brussel sprouts or beets on a menu, we have to order them. These did not disappoint. For supper, I had the pot roast filet mignon was was served with carmelized pearl onions, mushrooms and yukon gold potatoes. Usually when servers bring my meal and it is all on top and fancy looking, I take it apart and eat it separately because I am weird that way, but this time I couldn't because individually my meal wasn't exciting but amazing when it all mixed together. This was tough for a girl who hates her food touching. Greg had the bourbon glazed pork shank which was served with japanese and red garnet sweet potatoes and rosemary. Greg said it was delicious. On Saturday after the river dying for St. Patrick's Day, we went to Rosebud for brunch and it was so good. 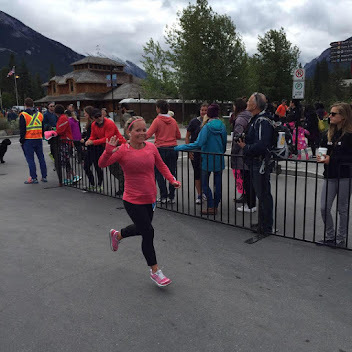 It was good to feel warm again mostly. Greg had eggs benedict and I had maple french toast topped with berries and whipping cream. So good, it definitely hit the spot. We ate so late that we didn't have lunch anywhere and just waited until supper at beatrix. Our first of many alcoholic beverages in Chicago. This was after trying to find a restaurant to eat at on our first night there and in the largest restaurant we had ever been in. It was insane in size. 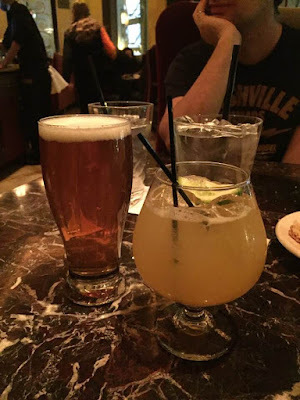 The food was alright but the drinks were on point and after a long travel day, it was just what we needed but I had only had starbucks and a burger from burger king when I devoured this drink so it hit me pretty hard. Thankfully I had a appetizer and a large meal coming soon after. 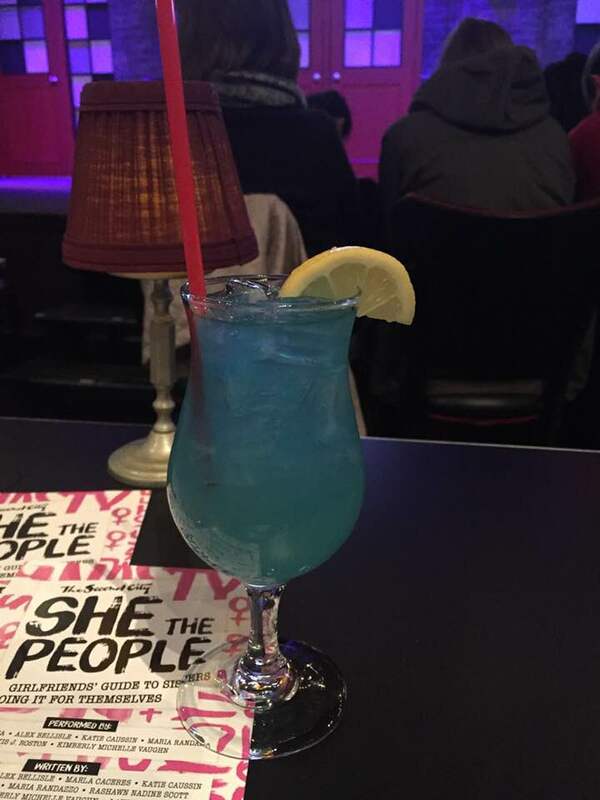 At Second City, I had a long island iced tea with blue curaco and that might just be my drink of choice when going out. It was the perfect amount of sweetness and deliciousness. Friday night after supper, we met up with one of the guys who came from Greg's company and his wife. I had never been to a piano bar and I loved it. 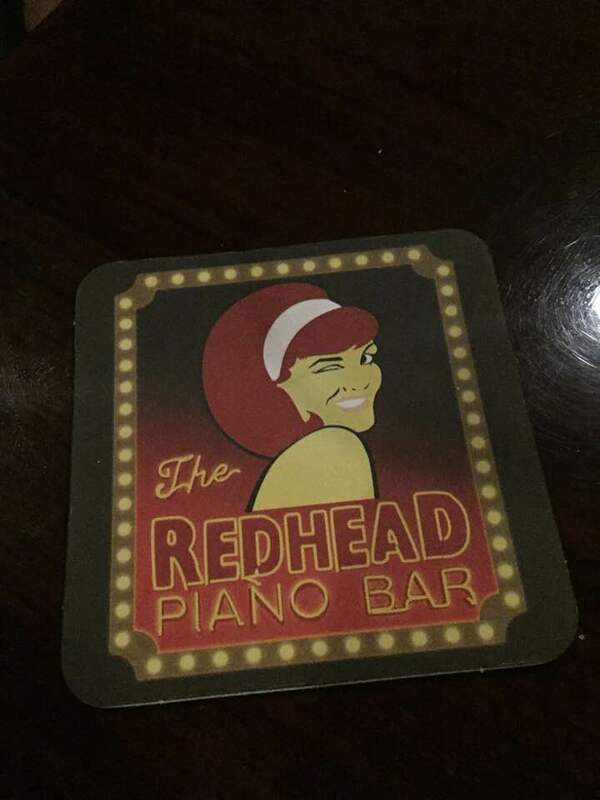 I need to go the dueling piano place here like yesterday haha. I had 2 martinis which I drank but I didn't like. Martinis were their specialty it seems but martinis are not mine haha. It was a super fun night. 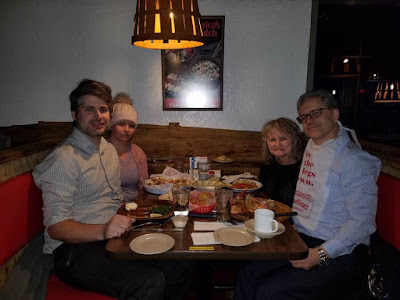 We had some other meals that were ok but this post is getting really long and I don't want to bore you any longer haha. Our last night in Chicago, we had dinner with Greg's aunt and uncle who live outside chicago. They are actually in the process of moving back to SK after 8.5 years here and we finally made it out here to visit just before they left. We went to a seafood house and it was amazing. Probably the best crab I have ever had. So good! Thanks again for dinner M + K! !